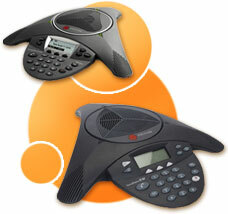 Not sure which Polycom SoundStation is right for you? How about a few tid bits to help? The SoundStation models offer advanced electronics to reduced echo and background noise as well as a LCD display for caller ID and length of call. Still not sure which is right for you? Click here for conference table reference layouts. Full duplex means that people at both ends of the lines can talk at the same time without getting their words cut out. Aren't all speakerphones full duplex? No, 99% of Speakerphones are NOT full duplex. It is new technology that only high end products can enhance. What is the difference between the SoundStation2 and the SoundStation VTX 1000? The SoundStation2 replaces the first Polycom Conference System. Since then, Polycom has developed many new advancements and features that are introduced in the SoundStation VTX 1000. This is the Higher End conferencing system that includes Polycom VTX Wideband. Are the SoundStation2 Basic, SoundStation2, or SoundStation2W Wireless expandable? No, but the SoundStation2 EX, SoundStation2W EX Expandable Wireless, and the SoundStation VTX 1000 are expandable. Can I expand my SoundStation2 EX, SoundStation2W EX Expandable Wireless, or my SoundStation VTX 1000? Yes, if it is an EX or the VTX 1000 then that lets you know that it is an expandable system. Will the microphones pick up background noise? No, they filter out all the constant noise so no background noise will be picked up. What if I don't have an analog line? No problem, you will just need to get the Polycom Line Converter.